Raffael of Moenchengladbach celebrates with Jonas Hofmann after scoring his teams second goal to make it 2-0 on Friday evening. The eighth-placed hosts still have a chance of qualifying for the Europa League and they doubled their advantage 10 minutes before half-time through a half-volley from Raffael after Jonas Hofmann's initial effort was saved by Koen Casteels. 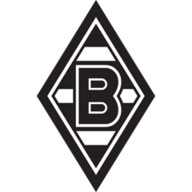 Gladbach, thrashed 5-1 at champions Bayern Munich last weekend, wrapped up the three points nine minutes later when Germany midfielder Christoph Kramer curled home a quick free-kick while goalkeeper Casteels was lining up a wall.